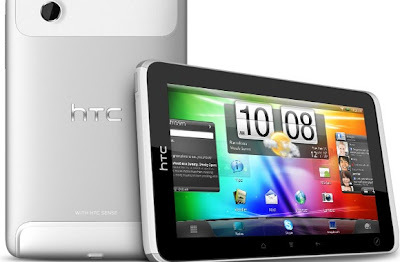 Brave New World: HTC Flyer Tablet On Its Way Next Month? 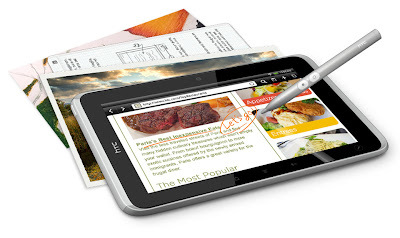 HTC’s Flyer will next month enter the tablet wars and it will offer something different – pen input. This will make it maybe a little more tactile, but will it make it a compelling buy? In its smart aluminum case, the 7” Android tablet weighs in just under a pound, is 0.5” thick and features; a 1024 x 600 resolution Super LCD touch screen, 1.5GHz Qualcomm MSM8255 Snapdragon single-core processor, 1GB of RAM plus 32GB of flash storage, a microUSB port and a claimed battery life of 61 days of standby and 4 hours with video playback. It also has a front-facing 1.3-megapixel camera, 5-megapixel rear camera, HSPA+ support, Bluetooth and Wi-Fi. The Flyer will run on Android 2.4, which is based on the Honeycomb OS used for smartphones but will use HTC’s Sense user interface and their obvious Android technology such as HTC Scribe and HTC Watch. However it’s the pen that catches the attention. The user will be able to use the pen to take notes, draw pictures, and sketch directly on the tablet. The note-taking app Evernote is preloaded and offer synchronisation too and with Audio notes also synced up with the written notes through a Timemark app we have potentially an interesting tablet. Imagine being in a meeting where you capture it in audio and in writing and by tapping on a word you are instantly taken to the appropriate audio point. The question is not whether this sounds a great innovation but whether users want it, will use it and perceive it as adding real value? There is certainly some real interest such that some million orders have been recorded and HTC claim an ‘order visibility to the end of August 2011,’ even before a release date and price had even been announced. The two videos may be a bit long but they clearly show the look and feel and demonstrate the use of the pen.